Camping holidays have been popular for decades and today there are some 1.2 million people in the UK who choose camping as their choice of holiday or holiday accommodation. One of the very first known campsites was that of the Cunningham Camp in Howstrake, Isle of Man which opened in 1894; and strangely enough all of the campers were male. It was open from May through to October and by the end of the century was attracting over 600 men to the site per week. The success continued which led in 1904 to the acquisition of 5 acres of land where a staggering 1500 tents and a 100 foot dining pavilion were erected in time for the following season. In the 1920's and 1930's camping flourished when the obsession for 'healthy living and the great outdoors' became popular amongst British holiday makers. By the 1960's camping holidays were becoming more and more popular as an alternative to the very much traditional boarding house or hotel. It gave people more freedom from the restrictions often imposed by boarding houses, and they could also make large savings on their holiday. Today, camping is still popular and with new technology the choice and quality of camping equipment has reached new heights. There are various types of tents available, each designed with a particular purpose in mind. So before you travel you must ask yourself these questions. How is the tent to be carried, e.g. in a rucksack or by car? Do you require one large sleeping area or do you prefer separated sleeping compartments? These have the best all round headroom and living space. They offer separate sleeping compartments, kitchen and living area. The frame is generally constructed of tubular steel. These are triangular in shape with a horizontal pole supported by two vertical end poles. These tents are very sturdy with plenty of headroom; however, the sides are unsupported so it is advisable that these tents are pitched end on to the wind, by the guy ropes. These are very simple to erect using lightweight flexible poles that thread through a sleeve in the tent fabric. The poles are usually made form fibre-glass or alloy. This type of tent is a great choice for the backpacker and can range from a 1 berth up to family sized. These are very similar to the dome tents, except that they have a different pole configuration. The flexible poles cross at different levels and hold the fabric taut and because of this are better suited than other tents in windy conditions. These have an extended ridge and dome and a good size porch area for shade, shelter or cooking; some even have windows. The poles are of tubular steel, alloy or fibre-glass. This is a term that applies to tents with sleeping compartments on either side of a living area. 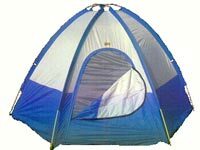 The basic tent can be either ridge or dome style. Most are made in lightweight nylon or polyester. These combine the features of the ridge and dome tents in a single design. They are strong and offer plenty of room inside. The hoop tent is favoured by the backpacker because of its lightweight, size and strength. Remember, hot weather will cause fuel to evaporate! The fumes will follow ground contours and may travel a long way unobserved. Ensure that your group know the location of the nearest fire point and how to use the equipment provided.